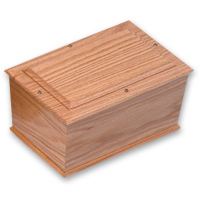 Plain sloping sided oak ashes casket. Veneered sides and solid top. Max. exterior dimensions (in cm) 19.5W x 30.5L x 14H. Access via top of casket.